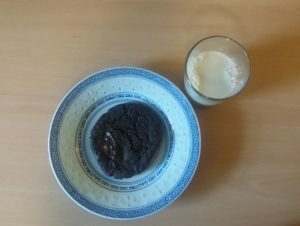 These vegan double chocolate cookies are really easy to make and delicious. Gabriel has a dairy intolerance so we often use non-dairy substitutes when baking and I’ve found I do not like the “eggy” taste when using eggs in cookie recipes so I’ve been playing around with alternatives over the past few weeks. If you want to you can easily substitute butter and eggs in the recipe, but the benefit for us is that we have a lot of vegan friends and they too tuck in to these delicious cookies. Great with a glass of almond milk, a hot cuppa, or when warm served with a scoop of icecream (Swedish Glace is a lovely vegan option that can be bought in most supermarkets). Mix together the two tablespoons of ground flaxseed with four tablespoons of water. Set to one side for 10 minutes to thicken up. In a stand mixer, or by hand, mix together the spread/butter and sugar until it is light and fluffy. Add the flax eggs and two teaspoons of vanilla extract and mix well. Mix together the flour, cocoa, bicarbonate of soda, and salt in a bowl and once fully combined add to the sugar mix and stir well until combined. Line or grease a baking tray and add heaped tablespoon sized mounds of the mix, with at least 2 inches between the mounds to allow for spreading. Allow to cool on the tray for 10 minutes and then move to a wired rack until completely cool. This recipe makes up to 30 cookies depending on how heaped your tablespoon of mix is. I often freeze half of the mix to bake another day, but once cooked they store well in an airtight container for up to 5 days.